I'm excited to announce that I'll be the 1st Sales Executive in Residence at the Center for Sales Innovation at St. Catherine University (St. Kates) in Minnesota. I've been involved in this program since it was founded in 1998 as a national resource for women in sales. At St. Kates, students can get a full 4-year sales degree with an emphasis on B2B or healthcare sales. Plus, they offer an accelerated sales certificate for adult learners who already have a health-related degree. 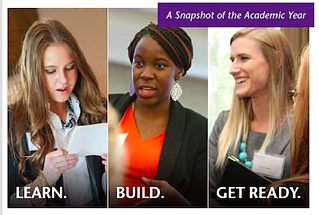 If you're looking to hire top-notch sales talent, check out St. Kate's recent grads. These young women want to be in sales. They're not just trying it out. They get up to speed really fast in their new sales job and consistently outperform other new hires. As the Sales Executive in Residence, I'll be working to enhance the sales curriculum, expand corporate sponsorships and develop a corporate advisory board. Additionally, every year I speak to juniors/seniors on sales careers and their first year in sales. Fun stuff! Join 145,000+ other savvy sellers who get Jill’s fresh sales strategies, practical advice, and helpful resources delivered to their inbox each week.